I just wanted to do a little update! I started back at school earlier this month and I’m already busy with readings and starting to work on papers (eep! ), but I just wanted to show off some of my recent doll clothing that I’ve made to fit Blythe. Everything shown was part of a swap package that I made for a dolly friend. The pattern for the knit dress was made by me. Pattern for the second dress comes from puchicollective.com. 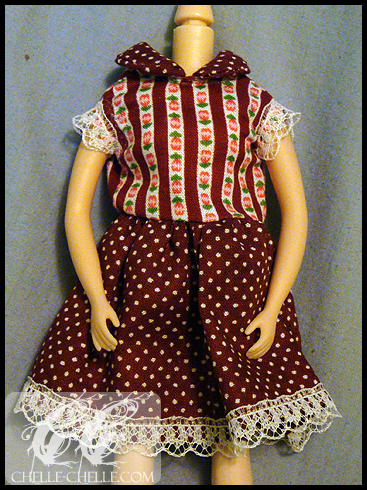 Pattern for the third dress comes from the Doll Coordinate Recipe book #5. Knit pattern of my own creation. 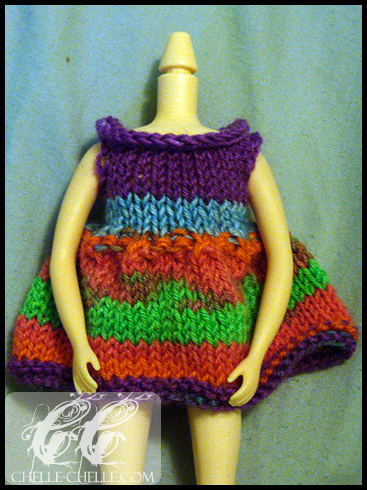 I love using self-striping sock yarn for doll clothes because there’s always some kind of interesting striping pattern that comes up! This wasn’t my first attempt at the Puchicollective’s Empire waistline dress. 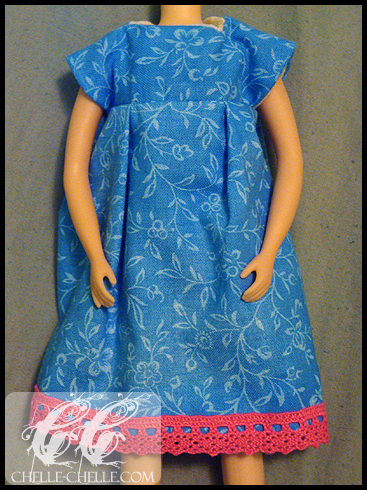 I like it a lot because it’s a simple dress, a lot of other crafters in the dolly community use this one as well. From Doll Coordinate Recipe #5. This was my first attempt at collars (!) on a doll dress. Also, the pattern doesn’t give any indication to use a lining, which I found very difficult (especially for turning the sleeves). In the future I’m going to include some kind of lining to the dresses that I make from DCR books.